Genuine Okidata Black Toner Cartridge ? Perfect Prints! Genuine Okidata Black Toner Cartridge for C5100 and C5300 Printers! 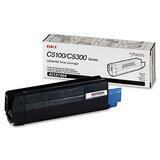 This Toner cartridge was designed specifically to yield a perfect print with the C5100 and C5300 printers.